We are spreading the goodness with a new line of delectable bulk nut butters. Three creative flavors offer limitless ways to enjoy, from topping them on toast to enjoying them right out of the jar. It’s time to up the peanut butter game. We are stepping into the wholesale peanut butter business by expanding our reach with nut butter products that offer a brand new spin on a traditional favorite. All of our nut butters are designed and produced with the highest standards of care. At our state of the art facility, we follow strict guidelines of professionalism and safety to ensure that our products exceed your expectations even before they reach your shelves. From flavor and texture to packaging design, we consider every single detail and always strive to create superior products. Buy Bulk Nut Butters directly from us! 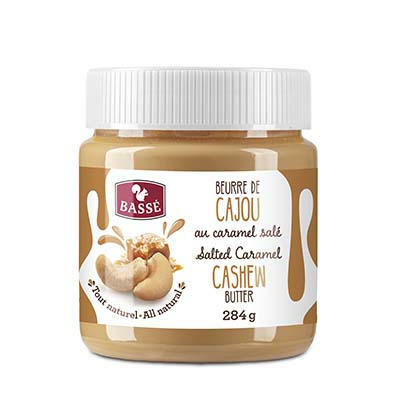 Salted Caramel Cashew Butter: A creamy blend of freshly roasted cashews and sweet salted caramel. 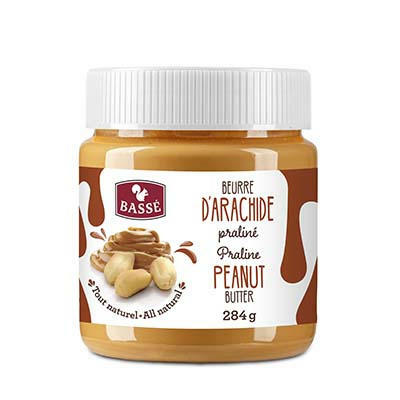 Praline Peanut Butter: An elevated peanut butter enhanced with natural praline flavor. 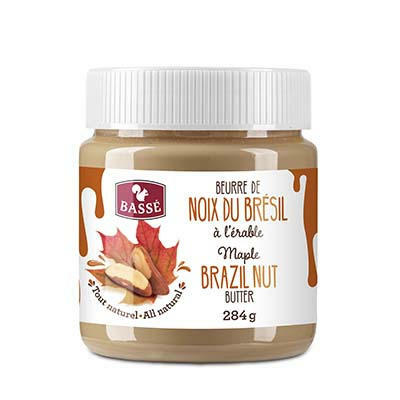 Maple Brazil Nut Butter: A perfect combination of smooth roasted Brazil nuts, organic maple sugar, and natural maple flavor. We are peanut butter manufacturers with a creative twist. And in addition to our unique takes on classic spreads, we also make it easy to join in on the fun. We provide wholesale and private label services that allow you to build your brand. Whether you’re looking to purchase bulk cashew butter or want to work with a private label peanut butter manufacturer to create products that are totally yours, we can partner with you to meet your goals. When you partner with Basse for wholesale products or private label services, you get the confidence that comes with experience, dependability, and transparency. Our nut butters are carefully crafted to align with today’s consumer tastes and trends, with package designs that help them stand out on the shelves. We are more than just your wholesale peanut butter suppliers—we are your partners in building a better brand. Let’s work on something great together. Partner with Basse and stock your shelves with the snacks that your shoppers are looking for, plus be the first to know about our inventive new product offerings. Get in touch today to learn more about our new line of nut butters and our wholesale and private label services.